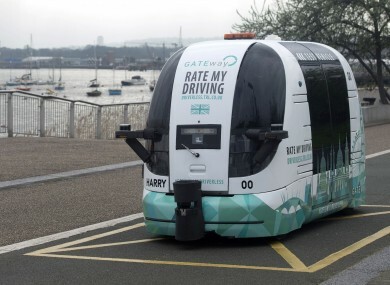 A driverless vehicle being tested in Greenwich, London. DRIVERLESS CARS ARE coming. It’s not a matter of if, it’s a matter of when. The ‘when’ is somewhat of a more complicated question however. It’s dependent not so much on when the cars are ready, but when we are ready for the cars. Diverless, or automated, cars have already been road-tested over millions of kilometres by a whole host of different companies. The early-running, or driving, was made by Google. The company’s self-driving project was started back in 2009 and has even been out on public roads, albeit for testing purposes. Other tech companies like Uber have since got in on the game and have been making serious strides but traditional car companies are now catching up. Mercedes for example has set itself a five-year target to make an autonomous car that can take over from the driver under certain conditions. The involvement of Mercedes should tell you something else as well, it’s not the United States where self-driving cars are being developed. Germany already has a number of zones on motorways and in cities where autonomous vehicles can be tested. Recently, Germany also agreed with France to test self-driving vehicles on a stretch of road linking the two countries. It’s an important step because connectivity between different systems where lanes and speed limits may change poses a challenge. But what of Ireland, where are we when it comes to the road-testing of self-driving cars? French automotive technology company Valeo has a hub in Tuam that employs 1,100 people, 600 of those are dedicated to research in autonomous vehicles. But as yet those cars have not been tested on public roads. As recently as last week Transport Minister Shane Ross was asked about Ireland’s preparedness for testing self-driving cars. The minister said that at present he is not aware of any proposals to test driverless cars on Irish roads, but he added that the State will endeavour to stay in touch with development. “The EU wish to have fully autonomous motor vehicles circulating in the EU by 2019 is an ambitious target,” Ross said. The minister also told the Dáil that a connected and automated vehicles (CAV) forum involving industry players met for the first time in last month. Present at the meeting were state agencies like IDA Ireland and Enterprise Ireland as well as representative body ITS Ireland. ITS Ireland promotes development of intelligent transport systems in this country and its director John Davis told TheJournal.ie that the forum was worthwhile in identifying the CAV activities currently happening in Ireland. “Everybody is still going through discovery or fact-finding around this whole area, because the technology is there and developing at an ever-increasing rate but the big challenge is how you actually adapt that technology,” he said. Davis outlined that there are six different levels of car automation and that it’s unclear exactly what level carmakers will reach. The levels go from ‘no automation’ to ‘full automation’. “We’re already I suppose between Levels 1 and 2 in terms of vehicles that are on the road,” David said. It’s just a case of how far up the levels we end up going. You can talk to different experts in the field and not everyone believes we’ll achieve Level 5 that it might be Level 3.5 or 4. Davis adds that the increasing automation of cars has more benefits than just the much-discussed potential to reduce road deaths. While people may be reluctant to put their lives in the hands of a driverless car, he argues that the ability of such cars to react quicker to dangerous situations will eventually convince people of their relative safety. In addition to that, there are other benefits such as potentially providing transport to people with a disability. There are many issues to be ironed out before this happens, not least complex legal questions surrounding insurance and culpability in the case of accidents. Davis suggests that ultimately there may be a model where people take out insurance on individual journeys based on factors like the route and time of day. That is perhaps “30 years” in the future though. The trend is going that ultimately car ownership will be a thing of the past. So you’ll effectively leave your house in the morning and just hop into an automated car, go a certain distance, maybe get a bus or a train and then hop into another car somewhere else. Email “How far are we from seeing driverless cars on Irish roads? ”. Feedback on “How far are we from seeing driverless cars on Irish roads? ”.